With the opening of Disney’s Beauty and the Beast, Virginia Rep proves fairytales can indeed come true, especially in the beautiful November Theatre on Broad Street. For anyone not familiar with this classic tale, here’s the condensed version. Belle, a lovely young woman whose also a voracious reader, trades her life for her father’s after he is held prisoner at the Beast’s castle (actually the Beast is a self-serving prince who was turned into a beast through a spell). And the prince isn’t the only one that was affected by the spell. His servants were turned into everyday objects – think teacup, candlestick, and clock. The only way to break the spell and set them all free is for the Beast (prince) to learn to love, and to be loved, by someone else. And, that could happen if Belle learns to love the Beast and he loves her. But as in every good fairytale and Disney movie, there are a number of roadblocks to maneuver along the way to that happy ending. Virginia Rep’s production brings all of the energy and excitement this timeless show demands. Director and choreographer Robin Arthur has assembled a cast that really owns the stage throughout the production. Ensemble numbers are strong, very entertaining, and well-executed. And while the ensemble often fades into the background in other productions, the members of this cast stand out on their own. Particularly fun to watch are the Silly Girls swooning over Gaston whose love affair with himself is off-putting to Belle. 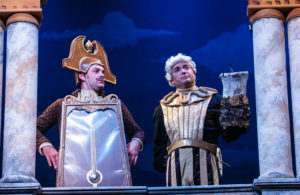 Much of the night’s humor can be attributed to the characters of candlestick Lumiere, clock Cogsworth, teapot Mrs. Potts, duster Babette, and armoire Madame de la Grande Bouche. Timothy Fitz-Gerald plays the frisky French Lumiere with a wink-and-a nod of naughtiness that is quite contagious and entertaining. Happy Mahaney is the perfect straight-laced Cogsworth who is a go-by-the-book kind of guy. Georgia Rogers Farmer brings a grand voice and a genuine enthusiasm to the motherly Mrs. Potts. Her rendition of the title song warms the heart. Young Ethan Dumeer who plays her son, Chip, is as cute as a button. Hannah Zold who plays Babette, and Tara Callahan Carroll who takes on the role of Madame de la Grande Bouche are also lots of fun to watch. Landon Nagel gives Gaston a certain swashbuckling quality. He especially rises to the occasion in “The Mob Song” where he vows to kill the beast. Chauncey Trask shows Belle’s softer, innocent, more demure side. She has an honesty that really comes across in emotional scenes with her father, Maurice, and with the Beast. Matt Polson as the Beast brings down the house in a performance that soars with energy and commitment to the role. He works through a range of emotions with ease and finesse. His humorous subtleties – the glances and mannerisms that – lighten the moment and bring a smile to your face. Joel Sherry’s set designs and Lynne Hartman’s lighting designs are as intriguing and well executed as the action on stage. They definitely bring that Disney magic to the production. The same holds true for Terry Snyder’s fabulous costumes and puppets that add color and life to each of the characters. And, the special effects in the show, especially at the end of the second act, are worth the price of admission. 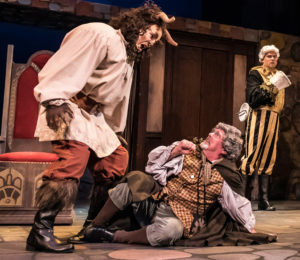 Virginia Rep’s Beauty and the Beast lives up to any Broadway version. 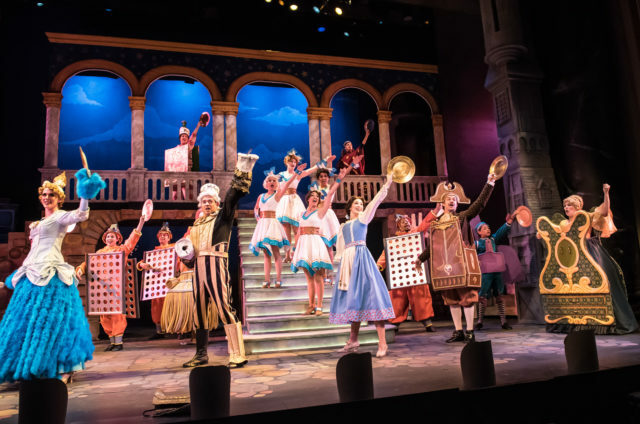 It’s a delight for people of all ages – another of Virginia Rep’s must-see productions. 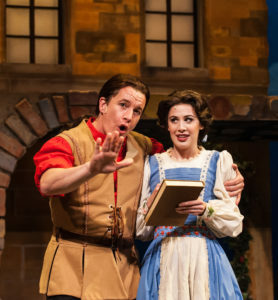 Disney’s Beauty and the Beast is running through May 14. Visit Virginia Rep for showtimes and tickets.